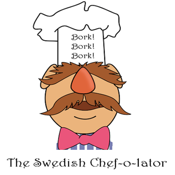 Ever want to learn how to speak Swedish Chef? Well, wait no more, the Chef-o-lator is a program that translates formal English into the Swedish Chef dialect. Type in the phrase you would like to translate and with the tap of a button, Yoou veell be-a telkeeng leekee-a zee-a Svedeesh Chef! This should bring back some memories...Bork! Bork! Bork!